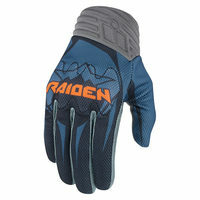 The RAIDEN Arakis Glove was built for a split directive with one solution – trail wearability with street toughness. Traditional MotoX gloves provide feel at the limit, but their palms and materials are not suited for the speeds and conditions of the street. The RAIDEN Arakis is the solution. Featuring our proprietary one-piece leather palm for this reason, the Arakis Glove has no seams or stitches to get in the way at the limit while still providing the necessary reinforcement. A mesh backhand delivers breathability, and a D3O® knuckle insert is integrated for both fit and reinforcement. D3O® Knuckle Insert offers low profile, ergonomic protection and increased durability without adding bulk. Ensuring a soft and flexible shock absorbing knuckle that combines comfort with impact protection. Proprietary seamless Battlehide™ palm uses abrasion resistant premium grade Battlehide™ goatskin because it is lighter than cowhide and is quite supple, yet extremely durable; perfect for hi-velocity engagements.